Every year in early May, America’s Law Enforcement community comes together in Washington D.C. to say good bye and honor the lives and memories of Police Officers who have given the ultimate sacrifice while under the uniform and badge of their community. None of them planned on their last day at work being their last day with their friends and loved ones, but the choice wasn’t theirs. While attending the Police Week memorial ceremony I stand among the crowd of thousands of police officers from every walk of our country, hearing the names of our fallen officers read out loud, realizing that with each year it takes more and more time to get through the growing list of names. As I look around at the faces and uniforms of these American heroes I think about the many painful memories they must have. Memories collectively locked inside their hearts and minds that would be enough anger, pain, disappointment and sadness to crush the average person’s soul, but not theirs. They all stand tall, in spotless uniforms and commanding demeanor and stay strong…..once again. That’s the way it is with us Cops…..we have to stay strong, programmed by a profession and mission of taking control when no one else can or will. We are pushed by our elected officials, the mainstream media and even our own leadership to be unbiased and impartial, to act as “un-emotional” as possible, to prevent any human failings from entering our responder mindset, no matter the cost. We quickly learn that emotion, if showed, is often-times the door that allows our failings to appear, emotion that is used against us by those who know nothing of the realities of what we do. So we push on, being strong in the face of the many challenges we face in our professional and personal lives, striving to meet the ever changing standards of policing that are demanded of us, regardless of our own humanity. But there’s at least one time a year we get to show our emotions, one time of year when we are surrounded by those that do understand, those that know what it is like. Without fear of scorn, shame or judgement, we can let the tears flow and shovel that pile of built up fear, sadness, anger and disappointment right out of our hearts and minds. 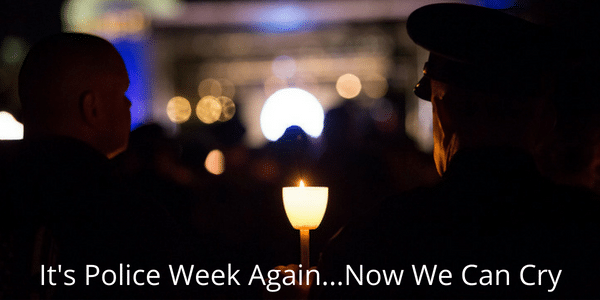 It’s Police week again…..now we can cry.